First to market! 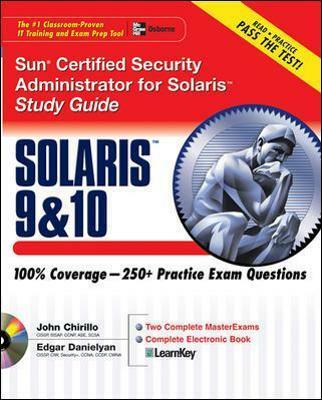 Written by two of the leading Solaris security experts, this Sun Certified Security Administrator for Solaris 10 study guide is the only exam prep book for this difficult certification examLearn from an integrated study system based on proven pedagogy, including step-by-step exercises, on-the-job elements, chapter self-tests and more.Run the UNIX based exam engine - included for Sun purists. About the Authors: John Chirillo, CISSP, ISSAP, CCNP, ASE, SCSA, is a Senior Internetworking Engineer at ValCom and the author of several computer security books. Edgar Danielyan, CISSP, CIW, Security+, CCNA, CCDP, CWNA, is a Solaris security expert and author.